7075 aluminum alloy‘s composition roughly includes 5.6–6.1% zinc, 2.1–2.5% magnesium, 1.2–1.6% copper, and less than a half percent of silicon, iron, manganese, titanium, chromium, and other metals. It is produced in many tempers, some of which are 7075-0, 7075-T6, 7075-T651. 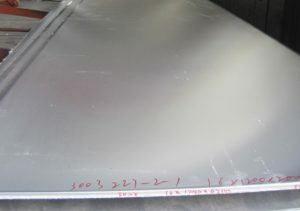 Due to their high strength-to-density ratio 7000 series alloys such as 7075 are often used in transport applications, including marine, automotive and aviation.These same properties lead to its use in rock climbing equipment, bicycle components, inlineskating-frames and hang glider airframes are commonly made from 7075 aluminium alloy. Hobby grade RC models commonly use 7075 and 6061 for chassis plates. 7075 is used in the manufacturing of M16 rifles for the American military. In particular high quality M16 rifle lower and upper receivers as well as extension tubes are typically made from 7075-T6 alloy. Desert Tactical Arms, SIG Sauer, and French armament company PGM use it for their precision rifles. It is also commonly used in shafts for lacrosse sticks, such as the STX sabre, and camping knife and fork sets. It is a common material used in competition yo-yos as well. RE: What is aluminium 7075 alloy? To the 7075 aluminum alloy, in addition to the use of daily life, with the continuous improvement of technology, aluminum 7075 is also began to use in important transportation areas, such as aerospace structure materials, at the present, it has entered the development of the automotive field. With the rapid development of modern aerospace industry, higher requirements for the comprehensive properties of high-strength aluminum alloys are put forward. At the same time, the development of modern nuclear industry and transportation industry is in urgent need of high performance, light and economic structure materials, aluminum alloy technology has become the trend of the times. The 7000 series aluminum is the strongest material in aluminum alloy. Especially, 7075 is super hard aluminum this is the main advantages of 7075 aluminum. With 7075-T651 aluminum alloy especially high quality, 7075 aluminum is praised as the best product of aluminum alloy, which has high strength and far better than any soft steel. The 7075 aluminium alloy has good mechanical and anodic reaction. The common product of 7075 aluminum alloy are 7075 aluminum sheet and 7075 aluminum profile. The representative applications are aeronautics and astronautics, mold processing, mechanical equipment and fixture, especially for the manufacture of aircraft structures and other high stress structures requiring high strength and corrosion resistance. 7075 aluminium alloy is a very high strength aerospace aluminium and is commonly used in applications where the strength of the material is critical and where the need for good corrosion resistance is not important. Offering superior stress corrosion resistance, 7075 provides very high yield and tensile strengths which is dictated by the particular chosen temper. 7075 Aluminium Alloy is used where high strength is critical and where good corrosion resistance is not important. It is classed as a very high strength aluminium aerospace alloy with superior stress corrosion resistance. Depending on the temper, 7075 offers up to 465 MPa yield strength and 540 MPa tensile strength. Aluminum 7075 is the major alloy in 7000 Series and Zinc is the major alloying element in this series. Aluminum 7075 possesses high static strength and is used in airframe structures and for highly stressed parts. Aluminum 7075 is available in several types of tempers such as T6, T651, T73, T7351 and T76.